Railpictures.ca - darrell lupson Photo: Sandwiched between a pare of CN GP38-2w,s CN GP9 7258 sports the 15th anniversary logo 8 years later. Being the middle unit in the consist and with remote capability the 7258 is actually the lead engine.Taken from the south roadway off cn property. The consist is without the east end GP38 ( Dec 4th ). | Railpictures.ca – Canadian Railway Photography – photographie ferroviaire Canadienne. Copyright Notice: This image ©darrell lupson all rights reserved. 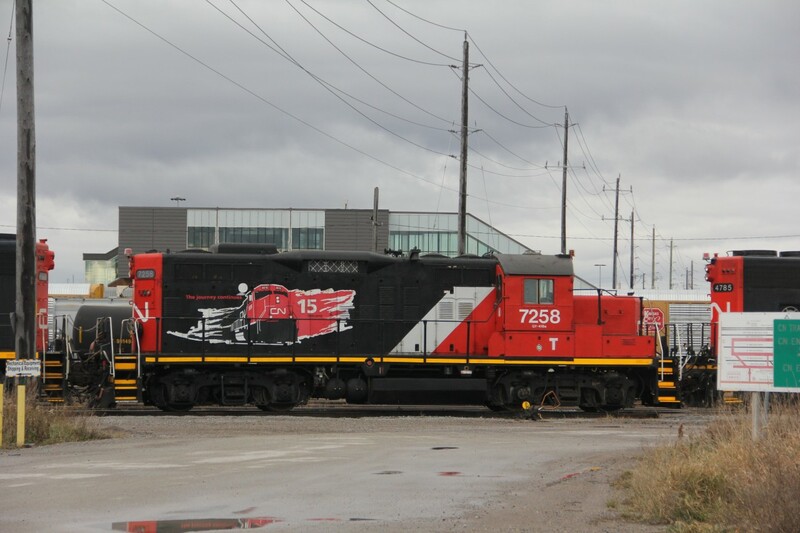 Caption: Sandwiched between a pare of CN GP38-2w,s CN GP9 7258 sports the 15th anniversary logo 8 years later. Being the middle unit in the consist and with remote capability the 7258 is actually the lead engine.Taken from the south roadway off cn property. The consist is without the east end GP38 ( Dec 4th ). Sad to think that this scene may no longer exist at the end of 2019 if GM closes the Oshawa plant as they have announced!! Over 100 years in Oshawa. The first cars were built in 1907. Sad if this comes to an end.